Value at the individual level is strictly personal. But as more buyers for the same item come into play the price of the item begins to stabilize. If there are hundreds of thousands of buyers, the price reaches a high level of consistency or what is called ‘Fair Market Value’. Essentially fair market value is the price that many buyers are willing to pay for the same item. There is another aspect of this definition too. That is the seller’s side of the equation. If there is only one of the item available and lots of buyers, the value of the item rises due to competition. A perfect example is the rare Stradivarius violin. One may go up for auction and when they do, lots of buyers bid up the value to well in excess of one million dollars. But when a maker produces tens of thousands of a similar instrument of similar quality like the maker Suzuki, the best quality violins from that maker never reach more a few thousand dollars apiece. It is reasonable to state that fair market value is easily established when there are lots of buyers and lots of sellers for the same item. This is how the stock market works. Each day major companies have their stock traded in the open market. Shares are traded at the rate of 100’s of thousands of shares per day for the top 30 (DOW) and in the 10’s of thousands of shares per day for the S and P 500. So how is fair market value determined when there are only tens of buyers and very few similar items? There are hundreds of models of cars and trucks in the market. Determining fair market value with newer models is easier than with aged vehicles. Almost 50% of all auto sales are for vehicles less than two years of age. So there is a much larger volume of buyers and inventory available to easily determine value. But as cars age the demand for that particular model and year diminishes. What ends up happening is the value range for a particular model spreads over a wider spectrum of price. There are some tools to assist sellers and buyers such as Kelly Blue-Book which takes the car and adjusts the core value by certain attributes including number of miles driven, condition, amenities and geographical location. I’ve seen the range of prices spread out over $1,500 on a core value of $12,000. That is over 10% in either direction. My point is that as there are fewer buyers and sellers of the same item, the fair market value is no longer a consistent price but moves into a range of value. The disparity of value increases. You could take two homes of a similar model built in the exact same year and end up with value disparity of upwards of $40,000. So how is value established? Additions – If the home for sale has additional floor space related to the model features or actual additions, the value in comparison to the comparable home is adjusted higher. Condition – Issues such as the age of the A/C system, siding and structure is adjusted using depreciation. Amenities – Inclusion or exclusion of certain amenities such as appliances, ceiling fixtures, moldings, countertops etc. are considered in the value. Exterior Storage – Any additional garage space or storage buildings adjust the price of the home in comparison to recently sold homes. Other – Visual inspections are performed to determine age of roof, existence of a fence, condition of concrete, quality and age of the deck and landscaping. All of these are considered in valuing the home. The goal of the appraisal is to determine the fair market value of the home comparable to recently sold similar homes with similar features. Most of the comparable data used is no older than six months. In effect the appraiser is adjusting the core value of the home to a price others have paid for comparable equivalents, the reducing the price disparity range. So this begs the question about evaluating an item that is rarely sold or has never been sold before. There exists stories of business owners selling their operations for millions of dollars. Many business owners wonder how the price is determined. The absolute best resource for determining value is a Certified Public Accountant (CPA) that has earned the business valuation credential (certification) from the profession. This professional uses weighted averages of several valuation approaches as described below. 1) Modified Book Value – The existing balance sheet value is adjusted for obvious factors that can impact the recorded cost such as antiquated technology, customer insolvency or bankruptcy, natural disaster and governmental restrictions and regulations. 2) Replacement Value – Some of the assets are reassessed for more modern value via the ‘What would it cost to replace?’ concept. Examples include buildings, heavy equipment, engineered processes and long-term contracts. 3) Liquidation Value – This method is mostly used with businesses that are in their latter part of the business life cycle. Assets are valued using a methodical sale of all assets or at auction depending on the circumstances. The drawback to asset-based valuation is the variability of values related to each of the asset groups. The longer the business has been around the more likely the historical cost value as reported on the balance sheet differs from the current value for a similar asset. So business appraisers use another approach – market comparable valuation. The earnings is straight forward as the annual earnings adjusted for any unusual and extraordinary events (proceeds from insurance due to a disaster, sale of a line of business, disposal of assets). The multiplier is a number from zero to as high as an eight. Naturally the higher the multiplier the greater the price or value for the business. I once witnessed a sale of insurance agency with a multiplier of seven. I couldn’t believe that anyone would use a multiplier that extreme. If you are buying a business and the seller states a number higher than a three, you should politely excuse yourself from the negotiations immediately. You can start your own business and ultimately get to the same earnings level within five years for a around a factor of 1.5 to 2 times the earnings. You’ll financially come out ahead. Any risk factor with an issue can severely impact the multiplier’s value. The cash flow valuation approach uses the net present value (successively discounted cash returns into the future discounted by a factor then summed into one number) to determine the value. It works very similarly to how a bond or a note is valued in today’s dollars. This approach is much more sophisticated than the other two approaches. It relies on consistent historical cash flows to reasonable determine future cash flows. This is unlikely for businesses with revenues less than $10 Million per year or for an operation experiencing a high growth rate. Therefore it is infrequently used for valuation purposes for small businesses. There are other valuation tools available especially for smaller business operations (less than $2 Million per year in revenue) including the multiple of discretionary income method which is a modified version of the market comparable approach. There is also the royalty/licensing method which follows the franchising model. For the reader, seek advice from your CPA first before buying or selling a business. 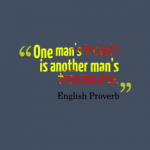 ‘One man’s trash is another man’s treasure’.